Can I just say wow? I don’t even know where to start with this book. It absolutely floored me, I loved it from beginning to end and I could not put it down. It’s one of those books that has left me staring at my cursor trying to come up with an adequate way to at least describe what I read, and tell you how I feel about it. I’m not sure I can. 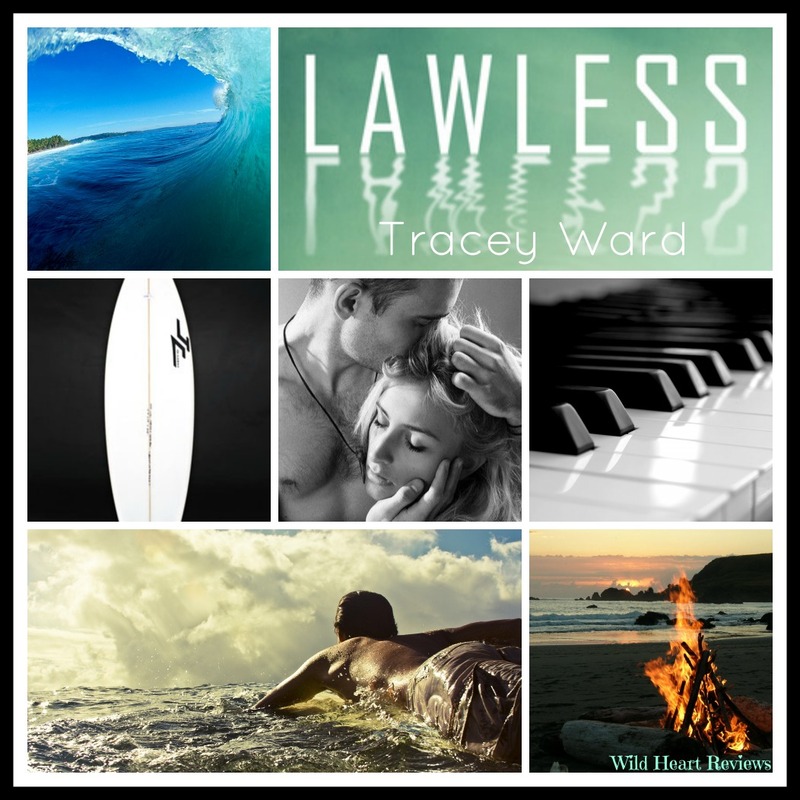 Tracey Ward is a new-to-me author, Lawless is the very first book I’ve read by her. It is not my typical type of read, lets go over why. It’s in first person, it is young adult, synopsis didn’t do much for me. So, why did I end up reading it exactly? The cover. I kid you not, I kept coming back to this cover. There was just something about it and I decided to read the book based purely on that. Mind you, it could have been a few other things. I grew up in CA, I love the beach, the ocean and… yeah. Surfers. 😀 However, aside from the surfer bit, it really was the cover. 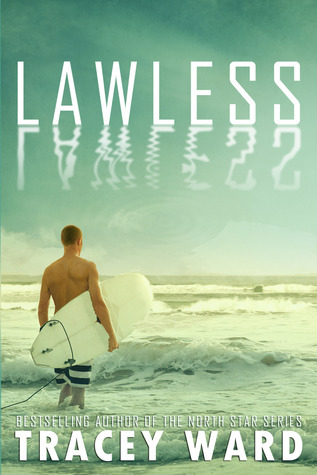 Lawless starts out with a bang, hits the ground running and you don’t slow down. There are no lull’s in the writing, no awkwardness, and frankly, nothing is predictable about this couple. I went through this book so engrossed in it, that I didn’t snag any quotes, or even moments to mention. A few really stand out to me, but I would consider even mentioning them a spoiler and the spoilers in this, even if mild, would give so much away. I fully believe this book is best read with no knowledge of what you’re opening the front cover too, because then you can fall into the writing. The characters themselves are ingeniously written. From the hero and heroine, to the co-stars. The banter alone in Lawless makes this worth reading because you will crack up laughing at the interactions between Rachel and her parents. Her inner monologue, all of it. Rachel is getting out of her little home town, where everyone knows everyone and no one has secrets. You get judged, or misjudged by the vast majority of whoever is concerned and the whole town will make something their business. Lawless opens with her laying on the beach, with her best friend and soaking up the last rays of the sun before she has to leave for Boston the next morning. Events transpire (yup, that’s def the way I’m going to keep massive spoilers from slipping in. 😛 ) that put Rachel in the path of Lawson Daniels. A guy she’s “known-of” her whole life. As she’s pointed out, they’ve talked all of four times, and once was in grade school when he pointed out she had a booger in her nose. Heh, these two don’t actually -know- each other, but when you live in a small town, everyone thinks they know you. Even when they don’t. What spins out from there is a summer love story about two people who finally “meet” and, see each other for who the other really is, and it’s just bad timing. It is a story that will grab you, hold onto you tight and take you for a whirlwind roller coaster ride of emotions. I laughed at this book, I sobbed over this book, I stared at it wanting to shake something, and when it finally ended, I let out the biggest, heartfelt sigh. I’m not sure if I will ever read another Tracey Ward book. I would honestly like to think so, as much as I loved this one. I guess it would just have to hit the right niche for me, like this one did. Or maybe if there is a spin off about Rachel’s best friend. 😉 Either way, when it comes to Lawless… I would say read it. I would say have a box of tissues on hand. I would encourage you to prepare to want to bite your nails off. I would tell you not to drink things while reading this, because you might actually spit something. Above all, I’m going to leave you with, if you do read it, I hope you loved it as much as I did. Next Post ★★ RELEASE DAY ★★ . :Crashed by Sherilee Gray:.